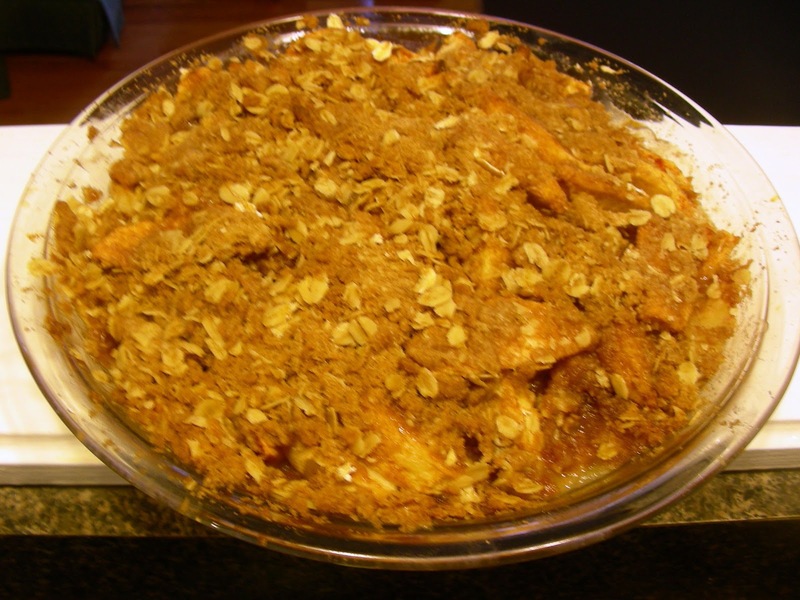 This is the Apple Crisp that I made for my son's birthday, which we celebrated last Sunday. You may remember that this son doesn't like cake or chocolate! Can you imagine anyone not liking chocolate. According to kgb.com about 4% of the population do not like chocolate, so my son isn't the only one. Therefore, I've been making this recipe for a very long time. I could make it in my sleep. almost. You can use apples, or any other seasonal fruit, peaches, plums, or pears. I've mostly made this with apples however. Because my baking and cooking capabilities have been limited, I had my sous chef peel the apples. I like Jonagold, because they are tart, sweet and juicy, but you could any apple of your preference. I have used Granny Smith apples also. To make this crisp a little healthier, I use old fashioned rolled oats to balance out the six Tbsp. of butter, and cinnamon, lots of cinnamon. And who says that you can't teach an old dog, new tricks? As I read Foy Updates Fall Apple Crisp recipe, I picked up her tip to turn the oven up to 400 degrees for the last five minutes of baking to ensure that the topping is crisp. Even though I make this for my son's birthday, which happens to be in October, Apple Crisp has always been a rite of Fall. I do not have a food processor, so I use a pastry blender to make the topping. If you don't have a pastry blender, you can cut in the butter with two knives. While I do like chocolate...I think I would prefer this dessert! I'm always one to chose an apple pie/crisp over cake or ice cream. This looks like a perfect end to a fall dinner. Beautiful crisp...and happy belated birthday to your son. @ Sprinkled with Flour - The pleasure was mine. @Monet- Thank you for the birthday wishes for my son. Apple Crisp is comfort food for me and my family. @ Magic of Spice- Thank you for your comments. i love eating apple crisp anytime of the year:) this looks really awesome i'm sure the birthday boy was really happy with this. thank you for stopping by my blog. You have a lovely weekend. You son is lucky, you made him something like this. I can't believe he doesn't like chocolate, I'd don't know what I'd do without it. I love the oats on top of a crisp. Have a great weekend, I'll be back to check up on you! Hope that you have a great weekend, too.